*The couple in this shoot asked that their names be kept private, but graciously agreed to let me share these photos. Last week, I was asked to shoot a surprise marriage proposal for a couple whom I’ve never met, but with whom I share a mutual friend. The proposal was to happen at The Broad Museum, which I love, so of course I wanted to shoot this! My initial concern on logistics was if I would even be able to bring my camera into the museum. Turns out, that was the easiest part of the shoot! 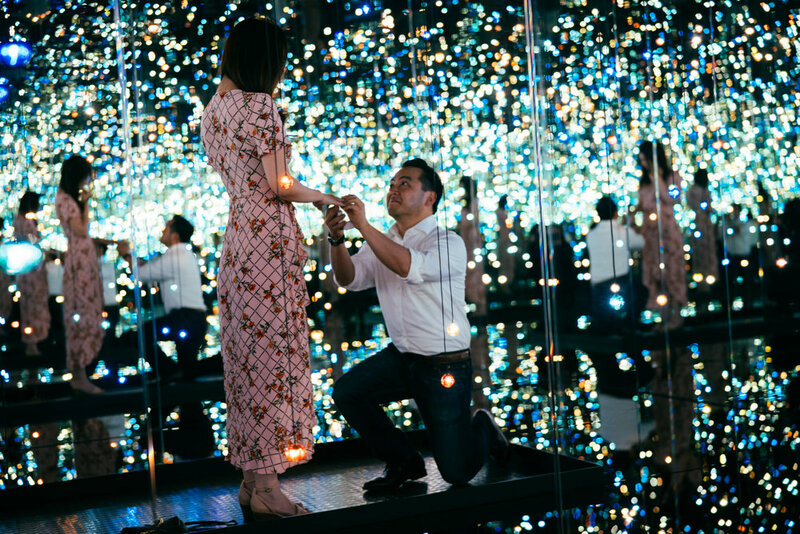 After getting more details, the future groom wanted to propose to his girlfriend in Kusama’s Infinity Room installation at The Broad in DTLA. For those of you who don’t know Kusama’s work, it’s incredible. And for those of you who don’t know this piece, Infinity Room in an immersive installation filled with mirrors on all sides and gorgeous colored light bulbs where participants have 45 seconds to be inside the room. The proposal was to be a surprise (natch) and the future groom also didn’t want his future fiancé to know that I’d be sneaking into the room with them to take the photos—the goal was for me to be in the room, taking photos, without her knowing I was there while he proposed to her. There’s a 3 ft wide by maybe 10ft long “plank” in the room, which is the only place to stand. And in order to even go into the room in the first place, you have to show up in the morning in person and put your name on a list to make a reservation—so there’s no guarantee that you’ll even be able to get in. Let me repeat…Infinity Room is A ROOM FILLED WITH MIRRORS ON ALL SIDES! FOR A PHOTOSHOOT! A SHOOT WHERE I HAVE TO BE DISCREET AND NOT APPEAR IN THE PHOTO! A SHOOT WHERE THE FUTURE BRIDE CAN’T EVEN KNOW THAT I’M IN THE ROOM! WHERE WE HAVE 45 SECONDS FOR HIM TO PROPOSE AND FOR ME TO GET THE SHOT! I am always up for a challenge, but as we started talking this through, I began to realize just how very challenging this shoot would be. There are no re-dos in a proposal shoot. There is no repeating of those 45 seconds. This was it. I realized that the groom and I were gonna have to go do a practice run. I’d been in the room once before, so I knew about the mirrors. I knew I was going to have to get the settings right and have them ready to go for the big moment. There would be no time for me to be fiddling with exposure for the proposal. Luckily, the friend who connected us up in the first place also linked us with her friend, who works at the museum. We now had a co-pilot and co-conspirator! The groom and I met at the museum two days before, and with the help of our museum friend, we were able to get into the Infinity Room and with an extra few seconds to practice. When we went in, I COMPLETELY did not remember that in addition to the room being filled with mirrors and lights, those lights are not static…the lights shift and change and flicker and brighten and dim within the span of those 45 seconds. There was not one master manual setting that I could make that would cover the whole sequence of light changes. This was getting trickier by the moment! The good news is that we came up with a plan on how I would sneak in behind them and where I’d be when we were in the room. Although I practiced my settings, I realized that there was no guarantee that I would be able to expose the images properly with the changing of the lights. I knew all that I could do for the upcoming day is to trust in myself and my experience and that I’d have to rely on that plus some luck. We did our best to mitigate any issues that we could run across. So Saturday rolled around. I dressed all in black to keep myself concealed. I hung out by the entrance to the room and as planned, our museum friend escorted the couple to the line. I nonchalantly stepped in behind them. The groom and I pretended to not know each other. His girlfriend didn’t know me from Adam, so she didn’t even notice me in line. When it was their turn for the room, I just quietly stepped in behind them, camera ready, shutter on silent. The door closed. I crouched down. The lights began to flicker. And the future groom dropped on one knee, asking his girlfriend to be his wife. It was beyond magical. They hugged and kissed and she cried (and I cried!). I shot and shot away and after they had a moment, he turned her around and said, “Suzie is here and has been photographing the entire time.” She jumped back! She never even knew I was there! WE PULLED IT OFF!!!! Massive congrats to this beautiful couple! I am SO so so happy to be able to share these magical pictures with you. They turned out better than I ever imagined. Sometimes you gotta take the leap, trust yourself and trust that all the parts will come together.